This traditional tune with new words by Morris Winchevsky and A. Litvin is arranged by Joshua Jacobson. 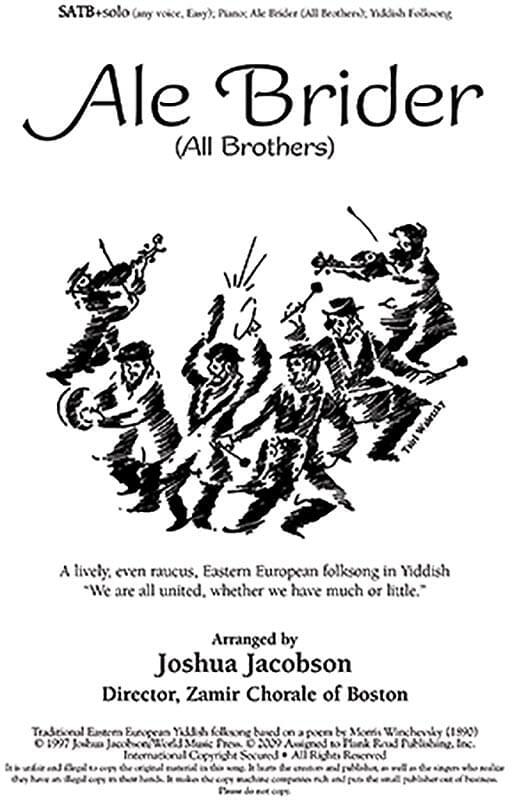 This joyful song of unity is in Yiddish, with singable English lyrics. "We are all together, rich and poor, sick and healthy, sisters and brothers." The call and response and easy chorus make it lots of fun! Filled with choruses of "oy yoy yoys" make this tune sure to inspire the audience to sing, clap, and stamp along. SATB; SA. The demo cassette available for this tune simply contains a sample performance. It does not include an accompaniment track.